Malpas Hotel is one of our most popular North Cyprus 5 star holiday hotels. Book your holiday at this curvaceous hotel in Kyrenia with Go North Cyprus and enjoy a luxurious stay for the very best rates available. 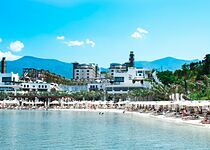 This popular five star hotel is beautiful both inside and out thanks to its hillside setting with the mountain behind and the sparkling Mediterranean Sea below. Set above the coastline, the main building curves around the hillside so every room and suite in the main hotel enjoys a superb mountain or sea view, while the mini villas and bungalows set in the lovely gardens enjoy superb sea views. From the moment the smiling doorman opens the door of your taxi, you know you'll be treated like a VIP at the Malpas Hotel. 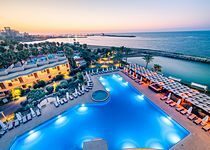 This five star destination hotel has all the facilities you'd expect for one of the original 5 star hotels in North Cyprus, but it's the service and friendly staff that add that extra touch of enjoyment. This popular five star hotel is beautiful both inside and out thanks to its hillside setting with the mountain behind and the sparkling Mediterranean Sea below. Set above the coastline, the main building curves around the hillside so every room and suite in the main hotel enjoys a superb mountain or sea view, while the mini villas and bungalows set in the lovely gardens enjoy superb sea views. It's hard to resist the large swimming pool at the Malpas Hotel, with its spacious sun terraces, sun loungers, parasols and the tempting clink of ice in glasses from the poolside bar! The pool has two circular sections divided by a pretty bridge, so you never feel crowded whether you swim or not. So, why not enjoy a morning by the pool, then an afternoon at the hotel's exclusive Cornaro Beach Club, free for hotel guests. Catch the frequent shuttle bus down to the Club to swim in the sea, stroll along the private jetty, or just lie back on a canopied daybed to the relaxing sound of waves lapping the shore. Enjoy the thrill of water sports, or the tasty snacks and drinks available at the beach front restaurant and bar. For a hotel holiday that is pure relaxation, opt for a room in the main hotel. You'll have plenty of space to relax, with the convenience of individually operated air-conditioning that you can adjust to your exact requirements. Enjoy the views from your private balcony, flop in front of the TV, or check your social media on the internet connection. For more space and a separate seating area, upgrade to a Junior Suite. For the privacy of a villa holiday with five star facilities, choose a bungalow or villa in the hotel grounds. Diamond Court bungalows have sea views from their balcony or terrace, and it's just a short stroll to the swimming pool. Pearl bungalows have two storeys, with a comfy sitting room downstairs and a galleried bedroom upstairs, plus a lovely balcony. Sapphire mini villas have more space for families and parties of friends, with two bedrooms, a sitting room and a large terrace with sea views to enjoy from sunrise to sunset. Please note subject to availability. If you enjoy a choice of food, prepared with pride and presented to perfection, you'll love the Malpas Hotel! Start your day with a buffet breakfast in the elegant Fontana Restaurant, and return for the excellent open buffet dinners featuring Turkish and international dishes. Enjoy a light lunch at the pool bar, tasty Turkish snacks including kebabs and authentic pides on the Malpasia Terrace with extensive views down to the coastline, or a sea-fresh fish dish at the Cornaro Fish restaurant at the hotel beach club. Tuck into delicious pastries, cakes and confectionary from the Cornaro Patisserie, perfect with an afternoon Turkish coffee or a pot of tea! You'll not be thirsty either; the hotel bars serve cool drinks during the day, exotic cocktails at sundown, or a glass of wine in the Cotton Jazz Bar while listening to live jazz and watching the twinkling lights below. If jazz isn't quite your thing, head down to the Cornaro Beach Club for a night of partying by the sea. As the sun goes down, with top DJs and Special International appearances. The Malpas Hotel is also home to the Beluga Casino, one of the top casinos in North Cyprus, and all guests are welcome to try their luck. The spa at the Malpas Hotel is well worth experiencing even if you just want to relax in the traditional Turkish bath, jacuzzi, steam room or sauna, swim in the indoor pool, or work out in the fitness room. Why not treat yourself to some serious pampering with a range of massages and beauty treatments, including: manicures, pedicures, nail extensions, skin treatments and even a foot detox. The Malpas Hotel is situated just 20 minutes from Ercan Airport by private taxi transfer, included with your hotel accommodation and flights to North Cyprus with all GNC package holiday deals!